Saltwater Habitat. Caught near reef areas. The scarlet or red coloured coral trout are typically taken in deep water (up to 100 m). 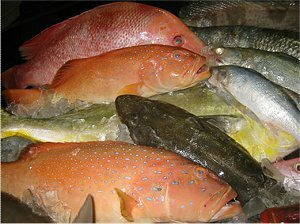 The bulk of coral trout taken by anglers fall to traditional bottom-fishing techniques employing cut fish flesh, prawns or squid baits, but the species also responds well to more sophisticated sport fishing methods. Coral trout strike savagely at all types of cast, jigged and trolled lures, live baits and rigged dead baits. Large commercial catches are still taken in some areas using a rudimentary lure or jig called a "wog", made from a sinker and strips of black rubber. Tackle for catching coral trout ranges from relatively heavy handlines to jig outfits and double or single-handed casting gear. Most reef fish are caught by hook and line, although the recreational sector also includes spear fishers.